Derek Porter Studio collaborated with Lam Partners on the lighting design for this new multi-hall performing arts facility located on the south edge of downtown Kansas City, Missouri. 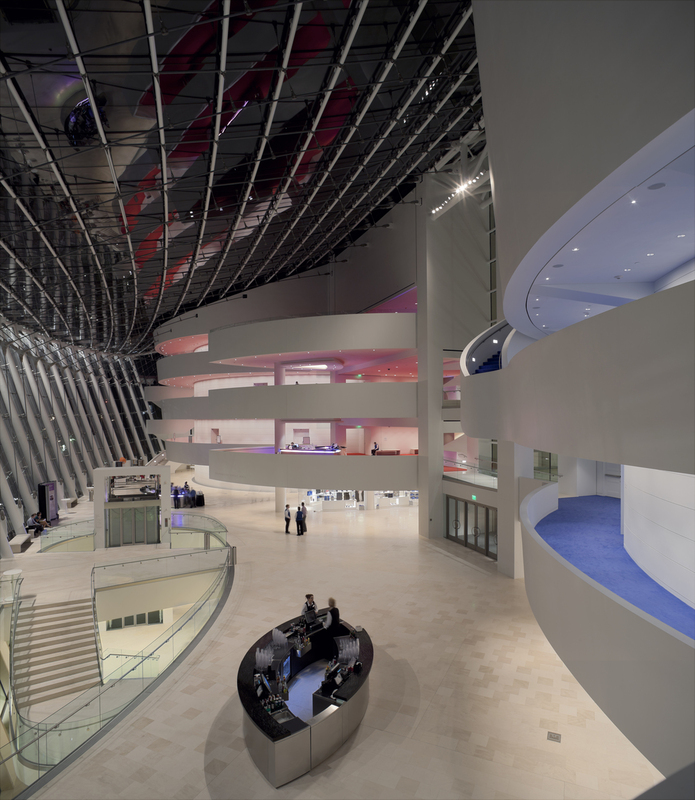 The elegant structure, designed by Moshe Safdie and Associates, is comprised of two shell-like volumes that house independent performance halls. Each of the two halls is conceptually designed as an “ovoid” that share a common four story atrium. The atrium is a glass enclosure that is understood as outdoor space which offers unobstructed panoramic views to the expansive lawn that covers the integral parking garage and the Crossroads Arts District beyond. The 1800 seat proscenium hall facilitates large scale musical, dance and theatrical productions. Lighting focus is given to the glistening balcony fronts that function as opulent chandeliers to the hall. These feature elements are complimented by vertically illuminated wall murals created by local art students which provide a colorful backdrop to the perimeter balconies. By contrast, the 1600 seat concert hall is an understated and elegant wood wrapped immersive environment for orchestral and smaller musical performances. The electric lighting is designed to reinforce the simple and singular use of wood material throughout. Skylights located above the stage have blackout shades that control vertical washes of daylight which create visual connection to nature and provide a stunning performance backdrop. The terraces located outside each performance hall have brightly colored carpet that is illuminated to create bounced colored light on the ceiling that is seen when viewing upward from the main atrium floor. This subtle phenomenal effect combined with glistening accents and views of the surrounding urban landscape expand artistic experiences for visitors and frame lasting memories for visitors to this notable arts facility.